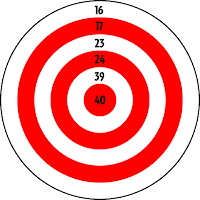 Q: You have a target with six rings, bearing the numbers 16, 17, 23, 24, 39, and 40. How can you score exactly 100 points, by shooting at the target. Finally a math puzzle, but then it has to be one that isn't very challenging. If you are having trouble, just keep firing arrows; you'll hit it eventually. Edit: You'll need the full complement of 6 arrows. Would it be wrong to say that this puzzle is very easily solved? allowing A to range from 0 - 6; B to range from 0 - 5; C, 0 - 4; D, 0 - 4; E, 0 - 2; and F, 0 - 2. Should only be 9450 possible answers, if my count is correct, easily scanned to see which one comes up 100. Or you could cheat, which I did, because I have no intention of sending in an answer, and the puzzle makes my head hurt, and a little voice told me to. Yeah, but I can hardly wait to see E&WAf's "simple" (presumably elegant) proof; and what is PC's "93 points" all about? Bob, enumerating the possibilities isn't nearly that hard. There are only 75 combinations that yield a sum between 85 and 100. (That's 1/126th as many as 9450.) The exhaustive list also proves that the answer is unique. Paul, making a list this way is what reveals that 93 is the only other sum in the range 85 to 100 that has a unique solution. Blaine's clue reaches the outer limits! I have a hint, but it is too much of a give-away. Another Sunday puzzle: What is the next letter in this series: U, D, B, V . . .? Since we all know the answer to this week’s puzzle by now, here’s a word puzzle you can try. Take the name of part of a country. Add the name of a flowing body of water. You get the name, phonetically, of a famous mid-50s Top Ten song that has become an American standard. In my submission to the NPR website, I started off with a simple proof that there is only ONE way it can be done!! Nice to hear a fellow Berkeley resident on Sunday Puzzle today! Did you notice how she kidnapped KQED and moved it across the Bay? Next thing you know, it'll appear at the end of Enya_and_Weird_Al_fan's proof! Jan, Yes, I was shocked!! Yes, Natasha and jan, I, too was shocked, shocked to find people living in Berkeley might listen to a radio station a few miles away across the Bay. Trying to figure out what I must have bet to win that, Paul. I'd never heard Peter Gabriel (or anyone) sing that song. As Will says, Peter repeater ;-). I prefer Take Five. Brubeck was a genius. As they say on Marketplace, "let's do the numbers." So a musical hint might be "Sound of Music"? Hey RoRo, have you started rolfing? Sometimes I rolf, sometimes I roll. Great technique for stretching out my neck (Which is something I tend to do anyway). Actually need to find a new practitioner. Some of the ones in my neck of the woods are still learning and not yet mature. ROFL reminds me of rolfing. . .
How do you solve a problem like RoRo :-) ???? WW sounds like the beginning of one of those"a priest, a rabbi, and an Iman walked into a bar" jokes. Excuse me while I rolf, rofl and roll. RoRo knows her ro, ro, ro your boat. . .
"Hey, RoRo, have you started rolfing?" was a riff off of her "Sound of Music" clue. Rolf was the boy who sang "You are 16 going on 17" to the oldest Von Trapp daughter. OK, any takers on the letter series U, D, B, V . . .? Yes, ROLFing is complete. No longer von trapped in silence. I tried; I came up short; send me to first base. Paul, there's a hint below in response to EaWAf's question about the letter series. Seriously. . .
Sunday it was a split decision for New York's two MLB teams. The Yankees held off surging Tampa Bay, 4 to 2, while in a battle of teams trying to avoid the cellar, the Cubs defeated the Mets 2 to 1. 4 17's and 2 16's make for a 4 to 2 ratio, or 2 to 1 in lowest terms. This puzzle is definitely overkill, as there are far more numbers than you need. Divide and conquer: divide 100 by 3 and you get 33-1/3. 33 is the sum of 16 and 17. 3 16's and 3 17's add up to 100. No problem. Just replace a 16 with a 17. Revolution: who besides WW and myself remember 33-1/3 rpm (revolutions per minute) LP records? Finally the two number pairs that are anagrams of each other and have the same sum: ELEVEN and TWO is one pair; the other is TWELVE and ONE. Believe both Will and Click and Clark (during their puzzle making days) used this one. correction: 3 16's and 3 17's add up to 99, not 100. Replace one 16 with a 17, and the 2 16's and 4 17's add up to 100. Did anyone actually answer PC's question about scoring 93 exactly? 3 x 23 + 1 x 24 is the unique answer. Well, well, well, well, well, well....I know, it's a deep subject. What 2 different numbers when spelled out anagram to 2 other numbers when spelled out AND the 2 numbers added together equal the sum of the other 2 numbers? Rephrased: A + B = C + D and A & B spelled out anagram to C & D spelled out, What are these four different numbers A B C & D? This reminds me of a NPR Sunday Puzzle of several years ago (but different from yours). That may be an "easy math problem," but it is also very elegant. Thanks for posting it. I assume answers such as six and seventeen, which anagram to seven and sixteen, are not supposed to be allowed. There are an infinite number of such answers. They seem to satisfy the wording of the problem, however. In response to the Tuesday Aug. 19 comments above by Word Woman (10:33 AM) and RoRo (2:10 PM) I have just posted on Puzzleria! possibly the weirdest “A guy walks into a bar…” story ever. 2 arrows in the 16 ring and 4 arrows in the 17 ring. Just Google "Sam Loyd 16 17 23 24 39 40" to find a link to the answer. Since 16+23=39 and 16+24=40, the 39 and 40 in the puzzle were actually not needed (although including them maybe would make the puzzle harder). I Googled, and came up with this cornucopia. I note that Gardner's approach fits in with my initial solution, and that, in his illustration, the '40 ring' is NOT a 'ring' ... or is it?? The previous comment should be a reply to jan's comment. Either Blogger or I messed up. I am still wondering why you tried to alert Blaine to my post????????????? That was all I could come up with too. This puzzle did not lend itself well to hints. 2(16s) + 4 (17s) = 6 shots at the target. 16 + 16 + 17 + 17 +17 +17 = 100. This requires a total of 6 shots at the target. Or: 2 x 16 = 32 and 4 x 17 = 68. 32 + 68 = 100. Or: 16 + 17 + 17 = 50, now double that. ELEVEN + TWO = TWELVE + ONE. Both sides of this equation are anagrams of each other! They are not just the switching of two numbers as in six seven & -teen. Beautiful, ron. I am going to use that with the kids tomorrow as our brain warm-up before we do the "Nuclear Physics and M & M's" experiment. The sign-off in my response, "LegoUnlucky," was an allusion to "unlucky thirteen," with 13 being the sum of 11 + 2 or 12 + 1. Before I quote my submission to the NPR website, a word about a term I use: I trust most readers here know what I mean by "congruence modulo 8". For the benefit of those who don't, two different numbers are said to be congruent modulo <some third number n> if the difference between those first two numbers is an exact multiple of that n. I suppose I could've expressed my first sentence more generally by saying "Notice that all of the six values are either exact multiples of 8 or else they differ from an exact multiple of 8 by just 1! My answer: To show that there is only ONE answer, consider the six values congruence modulo 8: (0, 1, -1, 0, -1, and 0). Since the desired total is congruent to 4 (or -4) mod 8, we must count either 4 of the 1s, or 4 of the -1s. The LOWEST of the -1s is 23, but 4 of those make 92, so you would need an 8, but the lowest number we have to work with is 16. So the ONLY solution then is 4 of the 17s, which now needs 32 which we can make with 2 of the 16s. Also having a unique solution: Scoring exactly 93 points. So did he figure out my proof? It's possible he did, as my logic can also prove his statement. Since 93 is congruent to 5 (or -3) mod 8, totaling that requires either 5 of the 1s or 3 of the -1s. Well, 5 of the 17s make 85 requiring 8 points to make 93. 3 of the smallest of the -1s (23), make 69 requiring 24 which we can just do. Of course, if we try for a second solution by replacing one of the 23s with a 39, then we've added 16 which reduces the required 24 extra to just 8 again. EaWAf, I remember congruent Modelo from field camp days at the local bar after a long hot day in the Arizona summer sun. . .
BTW, I am going to post a Weird Al link over at PEOTS next. It starts out with dirt and then wanders. . . So what's the answer to "What is the next letter in this series: U, D, B, V . . .?" The answer is in my question "OK, what is the next letter in this series: U, D, B, V . . . ?" Though I’m quite sure everyone knows the answer it’s 16, 16, 17, 17, 17, 17. First, I looked the puzzle on the Internet. Then, just to keep my hand in I wrote a little program in Qbasic to calculate every possible permutation of the six given target values. There’s one and only one answer. Also, last Sunday I posted a word puzzle. Take the name of part of a country. Add the name of a flowing body of water. You get the name, phonetically, of a famous mid-50s Top Ten song that has become an American standard. Julie London’s 1955 recording of Cry Me a River charted in at #9 in the nation in December of that year. It stayed there for 13 weeks. While walking Sunday morning I passed an English pub. Being reminded of my darting days I thought of one of my favorite three dart outs for 100. Two double seventeens and one double sixteen. Ton out, mugs away, mate. This morning, I posted on Puzzleria! 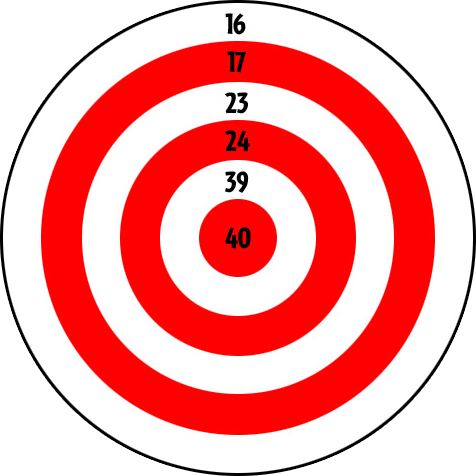 a more challenging (I believe) "target puzzle," for those of you who may be still willing to concentrate on the concentric. Okay, if you are going to shake me out of bed, you could at least have the NPR puzzle up. Probably not for another half hour. Everyone OK there? You had a close shave this a.m., Blaine! No injury or damage, I hope. Next week's challenge: This challenge comes from Jason Zuffranieri, who competed for the U.S. at the World Puzzle Championship in London a week ago. Name a world leader of the 1960s — two words. Change the last letter of the second word. Then switch the order of the words — that is, putting the second word in front. The result will name a hit song of the 1990s. Who is the leader, and what is the song? Yeah, but the first name of that world leader, and hence the last word in the song title, - is that really a word? There's an odd connection between our world leader and Mr. Auric Goldfinger. Actually, the first name really isn't. Seems Mr. Shortz deliberately used "word" instead of "name".